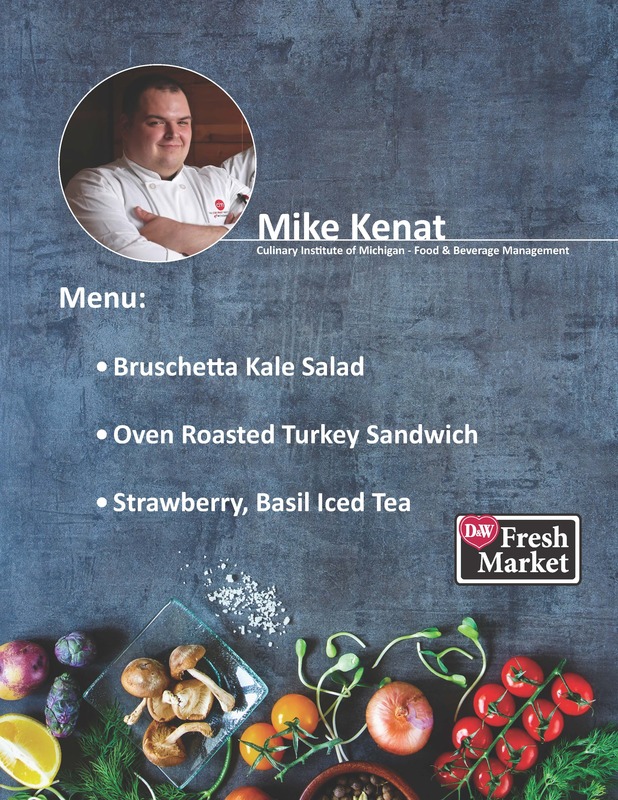 GRAND HAVEN, Mich. – The Grand Haven D&W Fresh Market will kick off a week of grand re-opening celebrations with a ribbon-cutting ceremony and culinary competition, taking place on Monday, June 20. The store, located at 1116 Robbins Road, recently underwent a $4.2 million renovation, featuring expanded produce and organic options, a Living Well “store within a store” section, larger craft beer and wine selection and much more (see related release for additional remodel details). The grand re-opening celebration begins with a ribbon-cutting ceremony at 10 a.m. Adornato will be joined by Store Director Don Fetrow, Grand Haven Mayor Geri McCaleb, Grand Haven Chamber of Commerce President Joy Gaasch and other community leaders and community partners. As a part of the grand re-opening festivities, students from the Culinary Institute of Michigan (CIM) will compete in a “Beach Basket Delight” culinary competition to showcase the many fresh, local produce options available at the newly renovated D&W. Eddie Jackson, Mike Kenat and Alejandro Guzman were each challenged to develop a menu of their favorite beach-themed foods, including a sandwich, salad and beverage. The trio will present their culinary creations to a panel of judges – comprised of McCaleb; Fetrow; Bruce Emery, SpartanNash vice president of retail – south; CIM Instructor Justin Raha; and Bruce Konowalow, CIM dean of Culinary Arts – for the chance to win CIM scholarships. The winner of the judged competition will be announced during the ribbon-cutting ceremony, and free samples and recipe cards for the Beach Basket Delights will also be available, while supplies last. Mike Kenat is working toward a bachelor’s degree in Food and Beverage Management. He is a line cook and brunch manager at Salt of the Earth and a chef instructor at Fustini’s Oil and Vinegars School of Cooking. 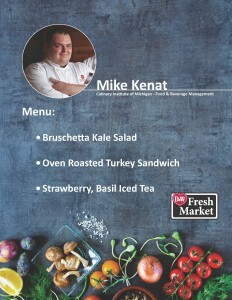 He will be preparing a bruschetta kale salad, oven-roasted turkey sandwich and strawberry and basil iced tea. 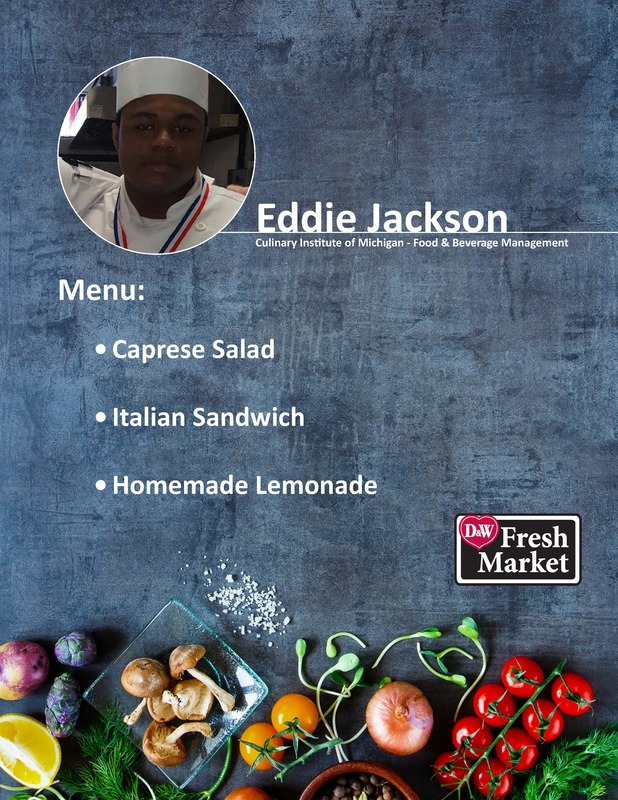 Eddie Jackson is a Food and Beverage Management student and sous chef at Tullymore Golf Resort. 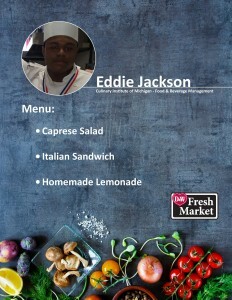 His menu is comprised of a caprese salad, Italian sandwich and homemade lemonade. 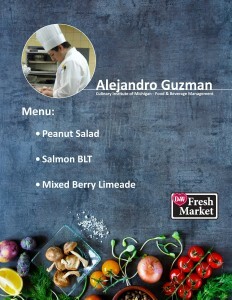 Alejandro Guzman is also pursuing a degree in Food and Beverage Management while working as a corporate chef for Bekins. He will be preparing a peanut salad, salmon BLT and mixed berry limeade. Store guests will be able to pick up the recipes and vote on their own favorite food-and-drink combinations from June 20-26. Voting will take place on the SpartanNash and Grand Haven D&W Facebook pages, or shoppers can use their recipe cards to scan a QR code and submit an entry at the Grand Haven D&W Fresh Market store. Voters are also encouraged to share photos and videos of their favorite creations using the hashtag, #SNBeachBasketDelight. The winner of the popular vote will then select a local charity, and SpartanNash will make a $500 donation to that charity in the student’s name. The three charities chosen by the CIM students are Hope’s Outlet Ministries, Inc., Love, Inc. and the Salvation Army in Grand Haven. In addition to the charitable donation through the Beach Basket Delight competition, a pallet of food will be donated to the Salvation Army in Grand Haven’s food pantry as a part of the grand re-opening festivities. Grand re-opening events to celebrate the $4.2 million remodel will span seven days (June 20-26), and will include product samples, live chef demonstrations, wine and craft beer tastings, culinary activities and giveaways, with an emphasis on summer produce and local and living well products. Each day will have a theme, such as “Made Fresh Daily” (June 21), Michigan Made (June 22) and Tastes Like Summer (June 24). Store hours are 6:00 a.m. to 12:00 a.m. daily. 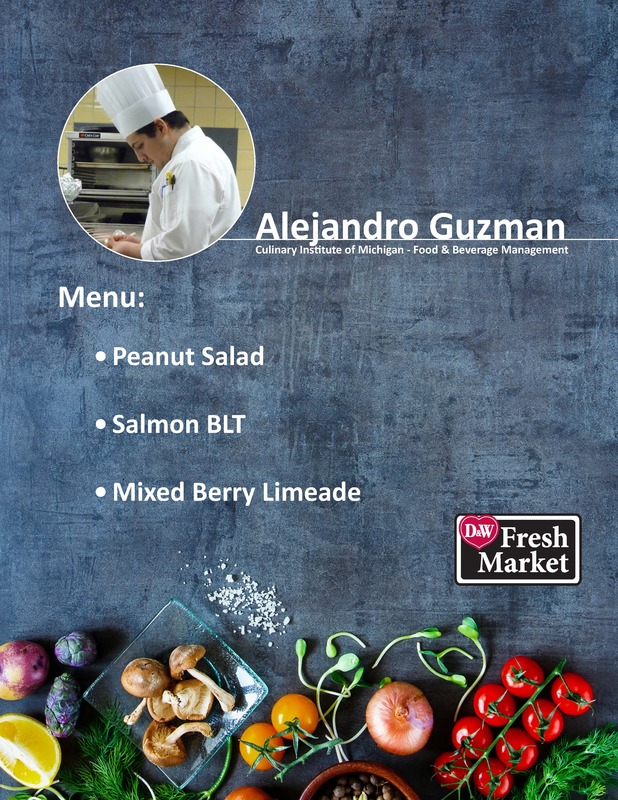 CAPTION: As a part of the Grand Haven D&W Fresh Market’s grand re-opening celebration on June 20, culinary Institute of Michigan students Mike Kenat, Alejandro Guzman and Eddie Jackson will be preparing their favorite “Beach Basket Delights” for the chance to win CIM scholarships. Store guests can also vote on their favorite culinary creations from June 20-26.